What is Archive Storage? Need storage for your documents? What is archive storage and how can it help my business? 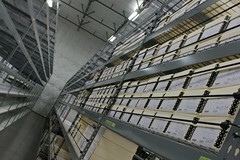 Some warehouses offer a number of different services for their clients, one of them being archive storage. This service is designed for the storage and retrieval of important and/or sensitive documents and usually benefits companies which are required to keep client documents, such as solicitors, healthcare and insurance companies to name but a few. Some warehouses also offer deep storage of such documents which are required to be held pending destruction. Archive storage allows you to store important documents in a professional and secure environment, freeing up space within your office. Warehouses that are able to provide archive storage will usually also provide services other than storage and retrieval such as scanning, shredding or destruction and delivery. Whichwarehouse are specialists in finding suitable commercial warehousing space for a variety of different business types. We have a number of warehousing members throughout the UK that can assist with archive storage for your documents. Alternatively if you would like to save time by not searching the net for warehousing companies able to assist with archive storage, call us on 0800 1707 555 and we can carry out the search for you. Best of all our service is free so won’t cost you a penny to have our team search our members and provide some suitable options.